Triggered by a recent post, see get-virtualportgroup, in the PowerCLI Community, I had a closer look at the Get-VirtualPortgroup cmdlet. So the question at hand required a bit more scripting than I originally thought. The HostNetworkInfo object contains all the required information about vSwitches and portgroups. To make it easier to link all the vSwitches, portgroups and used ports together I decided to go for PowerShell’s hash tables. This is a schematic view of the nested hash tables used in the script. The script loops over all the ESX/ESXi hosts that belong to the cluster. It populates the hash tables with the vSwitches, portgroups and ports it can find in the HostNetworkInfo object. It loops through all the powered off guests on the hosts and find for each network card to which portgroup it is connected. Finally the scripts displays the data it has captured in the hash tables on screen. Line 4: Loop over all the nodes for the requested cluster. Line 12-14: If there is a portgroup defined on this vSwitch that is not yet in the $pgH hash table, add it. Line 22-23: The $pgH hash table contains an array with hostnames of all the nodes where the portgroup is found. Line 26-28: Inject the information from the Port property into the $puH hash table. Line 39-53: Enter the information from the network cards for all powered off guests into the hash tables. Line 46: Increment the counter of the used ports for a powered off guest. Line 56-77: Display the results on screen. The following screenshot is from a run of the script on a 2-node cluster. The report shows clearly that there is a portgroup, called PG77, on node esx4.test.local which has 0 ports in use. This looks clearly like an unused portgroup and would require further investigation ! This script is great. 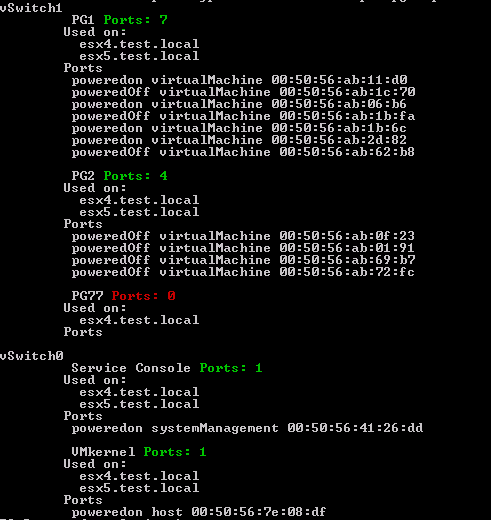 However, i wonder did you or vmware public some document how we can manipulate and getting familiar with the powercli. I already wen to the link https://www.vmware.com/support/developer/vc-sdk/visdk400pubs/ReferenceGuide/vim.host.NetworkInfo.html, but i don’ know how we can manipulate the object or try to discover the value properties. May you please give me a hint here ? . Thanks. For learning PowerCLI, and don’t forget you will need to have some basic PowerShell knowledge as well, there are a number of introductory resources available. See the sidebar on the PowerCLI blog for some pointers. For diving into the vSphere API you will need to refer to the API Reference, it also has sample code. On the PowerShell part, there is a good intro at the Microsoft MVA site. Wondering if there had been updates to this script to work with VDS and vSphere 5.5? This is exactly what I’m looking for in order to complete some tasks. Would appreciate any insight! I’m going to hazard a guess that you never determined why it didn’t work for vSphere 5.0+? Running into the same issue. This script does not seem to function properly on ESX 5.0. Are there changes that need to be made for the newer ESX versions? It’s not accurately displaying the VMs connected to my portgroups so most of them appear unused. Hi Jordan, yes, you are correct, that Ports property doesn’t exist for portgroups on dvSwitches. It should be possible to do this though, have a look at my dvSwitch scripting – Part 12 – Find free ports post, where I find the first free ports on a dvSwitch portgroup. You may find time to work on the script? @Sven. I’m currently in the final days of writing for our upcoming book. Once that is done I will tackle all the open questions and requests. Fine, I’ll wait for it. have you know some script that can do such a thing? There is indeed no such function (yet). That should be possible. But first I’m going to try to fix the problem with zero counters that was reported earlier. After changing the cluster name on top of the script i run the script. It show’s me on several networks “Ports: 0” but there are 6 VM’s connected. The values for “used on: “ are correct. Very useful script. Thanks Luc.